Here's the GPS track for a section of Peach Valley north of what I've explored earlier. 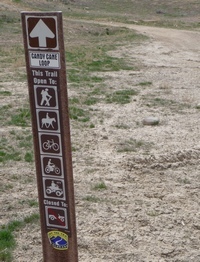 Two roads lead to trailheads down into the Gunnison Gorge Wilderness. Click on image for more detailed GPS track. Yesterday (Friday) I explored more of Peach Valley Road, moving further north. Peach Valley Road is a real “road,” meaning cars and trucks can traverse it without too many problems. The GPS track starts at the Parking Area. The Parking Area has some nice improvements, such as designated parking places, special parking for those with trailers, a few covered picnic benches, a restroom, a special “training” area for children and others just learning about riding dirt bikes, and a large “open area” for riding. In the track image above, you can see the northern tips of tracks I took earlier. I tried some of the free-form tracks just north of the Parking Area, finding a nice assortment of easy-to-intermediate tracks up and down over the Adobes (Dunes). Some of the uphills were a little more than I wanted to manage, so I left those alone. 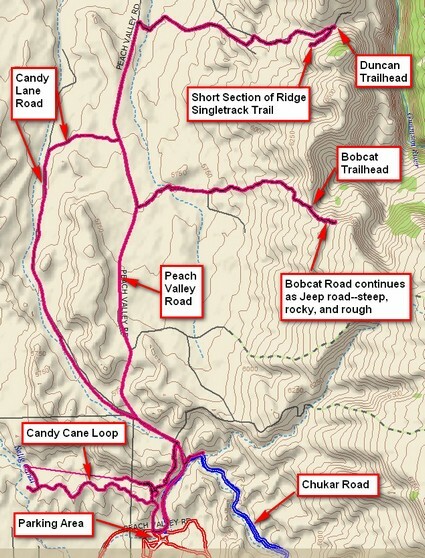 Here's the official entrance to the Candy Cane Loop, a double-track that's pretty straightforward and enjoyable. Much of the trail, which crisscrosses with other trails, is not terribly well-marked, so you must exercise judgment as to which way to turn! Traveling further north on Peach Valley Road, I found an entrance to Candy Cane Loop, a double-track that winds its way around and over the adobes—you can see a short length there where the GPS couldn’t find a good signal (the straight line). I’d rate this loop as beginner to just beyond beginner. The entire track is in soft dirt, so if you fall over you don’t have to worry about rocks. Part of the track follows the tops of the adobes—it pays to concentrate here. Further, the way some of the turns are sloped, it pays to keep your speed up. From there the track goes on up Candy Lane Road. The word “road” is charitable. It travels up a long, low, empty valley. Completely empty! I did find some tiny purple flowers, but had to look for them. The road is just plain dirt and those who traveled through when it was damp left some ruts—be careful they don’t grab a tire. Ride standing up with some speed (15-25 mph) and be prepared for dips and holes. Keep your eyes ahead and you should make it over any of the ruts that you tried to steer away from but didn’t quite. Although my GPS showed that Candy Lane Road continued to head north, it sure didn’t look like it. So I took a well-traveled track to the east, heading up over some hills and down to Peach Valley Road. Peach Valley Road, though dirt, receives some maintenance and already has been scraped to get rid of the worst of the ruts. I went north, taking the road to the east to Duncan Trailhead. Trucks and 4WD vehicles will have no trouble with this road. It can be traversed in a 2WD normal vehicle with prudence. The views are nice. There’s a singletrack trail that follows the ridge; I tried this to the south for a bit but found I couldn’t go further for several reasons: it’s steep, it’s narrow, it’s full of loose rocks (scree), I was too tired to really attack it properly, and, all things considered, it was too advanced for my skills. Had I been with someone who could mentor me, I might have given it a try, but in this case I turned around and headed back down the road. Next I tried the road to Bobcat Trailhead. The last part was rather steep, though I had no trouble with it. Several hikers didn’t attempt the last part, leaving their vehicles and walking the rest of the way to the trailhead. 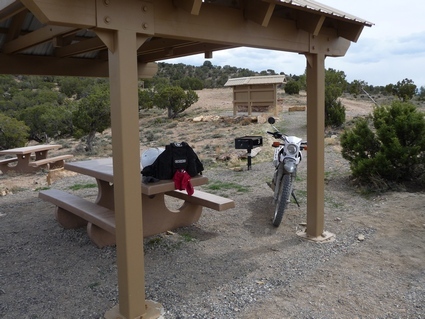 The trailhead itself has parking, a restroom, a covered picnic table, and some gorgeous views (see this post). From there the ridge trail is no longer singletrack, but a 4WD road. I went up a ways, but ran into the steep/rocky/scree problem again, plus at this point I was completely pooped, plus I saw rain on the horizon. So I went back down the road, turned south on Peach Valley Road, exited the Peach Valley Recreation Area, and headed for home.